Disney's turn. The Pacific set Moana has been getting most attention so far, but the first of the two films due out next year is actually Zootopia, due in cinemas next March. Disney have already released some promotional art from the forthcoming flick, but now we've got our first chance to see it in motion thanks to the very first teaser. Well.. sort of, as this is one of those fairly rare teasers that doesn't seem to actually feature footage from the actual movie. Instead, it introduces us to the film's basic conceit- that of a world populated by anthropomorphic animals. The Zootopia of the title is a city populated by animals from all over the globe. As the official synopsis (released alongside the teaser) has it "it’s a melting pot where animals from every environment live together". The trailer introduces us to the main characters, a fox named Nick Wild and a police officer rabbit named Judy Hopps who the plot will see forced together in a fuzzy twist on a classic buddy-cop movie. Although we may not get to actually see the bustling metropolis itself, we get to see it's residents and it's eye-catching visual style. While the idea that the audience needs to have the idea of anthropomorphic animals in animation seems a tad unnecessary, we really like the style of this trailer. It certainly does the job it was meant for, and has made us keen to see more. 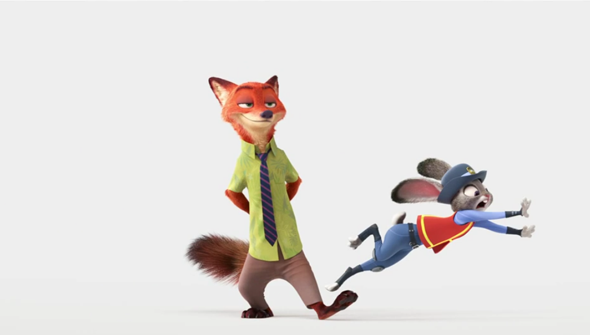 Zootopia is directed by Byron Howard, Rich Moore and Jared Bush and will open in US Cinemas on March 4th 2016. Thanks to copyright reasons, the film will be released as Zootropolis in the UK where it will open on March 25th. Check out the teaser below.